﻿THE SKEPTICAL HANDICAPPER IS HERE! Isn’t it about time you had the facts you need to win at the racetrack? Is betting a horse who was claimed last start a winning strategy? How about if you look for class droppers who are switching jockeys? Should you wager on every horse who won last out by 8 lengths or more? If you combine first-time Lasix with early speed last race, what happens? What if you bet every 2-year-old debuter whose last work was a 5-furlong bullet? Barry Meadow has the answers. In his new 445-page hardcover book, The Skeptical Handicapper: Using Data and Brains to Win at the Racetrack, he’ll show you what he’s uncovered from analyzing the results of every race run in the U.S. and Canada between 2014 and 2017, a total of 168,227 races. Meadow spent more than twenty years playing the thoroughbreds full-time. And what he’s found—from his own successful gambling, and with a study of dozens of handicapping factors based on research he conducted with the help of thoroughbred analytic specialist Ken Massa—is sure to make a powerful difference in your game. There’s nothing else like it on the market. What is winning today? And what can help you win today? It’s all here. When should you play against a high-figure horse? Can you make money by calculating earnings per start? How do trainers fit into the picture? On favorites, does the jockey’s win percentage going into the race matter? What is the most important element in handicapping turf sprints? It’s all here. And whether you’re a newcomer to horse racing, or you’ve been playing the game for decades, there’s plenty of strong information that will help you improve your racetrack results. If you’re serious about winning at the races today, this is the one book you must have. Order directly from TR Publishing and Barry Meadow will personally autograph your copy, and pay your shipping costs as well. 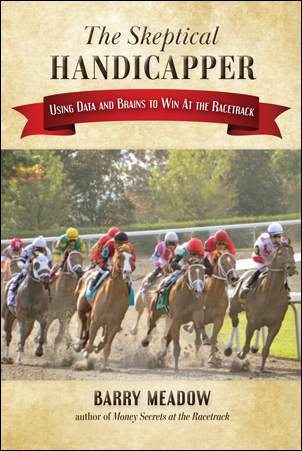 The Skeptical Handicapper: Using Data and Brains to Win at the Racetrack, is $37.99.